… completely peaceful and free! surrounded from pine trees, shrubs and perennial cedars. helps to improve our connection with the environment and to realise our place in it. brings us closer to our basic drives and reminds us of our actual needs. focusing on our human functions and deepening the connection with our inner self. meditation sessions accompanied by Tibetan singing bowls. Singing bowls have been used for healing and meditation purposes over the years. restoring the vibratory frequencies that are out-of-harmony and diseased. Gavdos is the most southern island of Greece and the southernmost point in Europe. It is located 24 nautical miles south of Creta in the middle of the mediterranean sea, with an area of 37 square km (9km long, 4.5 km wide) and the highest point at 345m above sea level. The island has very few permanent residents (around 60 people) scattered in small settlements, but hundreds of people from around the world visit during the summer period. Blessed with the finest of nature, Gavdos offers pristine seashores with cedar trees almost reaching the water, dense piney and juniper woods and beautiful cobblestone footpaths through wild nature with unimaginable views of the sea. Gavdos is also known to have therapeutic properties. It treats wounded hearts and souls, reveals new potentials and awakes unknown senses. It’s a return to nature and your roots! Gavdos is one of the most important area stations of the migrating birds through Europe, as well as a refuge for endangered species of seals and turtles careta-careta. The island has been declared as a protected area under the European network of Natura 2000. Guest should love and respect nature and be prepared to spend a few days, away from the noise but also away from many unnecessary comforts of the civilised world. Also due to its location, Gavdos is subject to unpredictable weather conditions. We strongly advice you to leave a few days free after the retreat and before your flight, as it may not be possible for the boat to cross for a day or two, if the winds are too high. We are going to spend most of our free time wandering around the island, following footpaths through wild nature and magnificent landscapes, so don’t forget to bring your walking shoes and a hat. 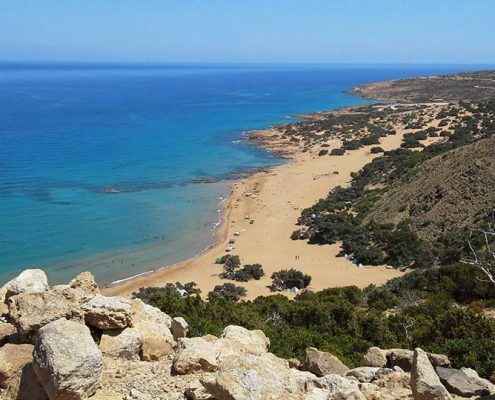 Our first trekking tour will be to ‘Ai Giannis’, a beach that is characterised from unimaginable beauty of sand dunes, rocks and cedar trees. It has been awarded as the second best beach in the world from the discovery channel in 2007. We will then continue the path to ‘Lavrakas’ beach and pass through a forest of perennial cedar trees to the beach of ‘Pirgos’. 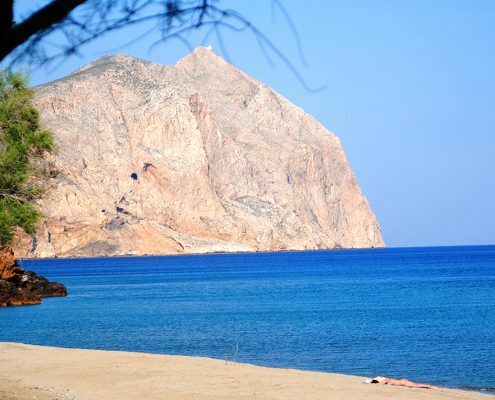 Our next excursion will start from the beach of ‘Korfos’ to ‘Tripiti’, one of the most famous attractions of the island, as it is located at the southernmost point of Europe. The landmarks of the beach are the three arches and the giant chair standing above them, from where you can enjoy a panoramic view of the Libyan Sea. We will then pass through the small village Vatsiana on our way back to Sarakiniko. Finally we are going to take one of the most beautiful routes from the settlement of Ambelos to the lighthouse of Gavdos, which is dominating at the ruggest coast of the southwest side. It was built in 1880 and was visible from a distance of 40 miles, a record for these times. Our schedule for the week includes many activities including daily yoga practice, meditation sessions and trekking tours, but also plenty of free time for everyone to enjoy this unique island depending on their needs and preferences. Most of our group will be staying at the “the Exiles House” in Sarakiniko beach, where most of the activities will also take place. It actually used to be a house of Exiles in the 30’s for more than 250 people, including leading figures of the Greek movement. The house is now transformed into a relaxing cafe, offering all day snacks, healthy meals, juices and smoothies with an unbelievable view of the sea. 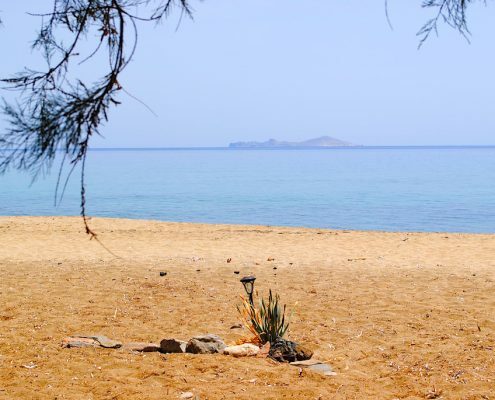 It is located on a little hill at the west side of Sarakiniko, with a beautiful terrace overlooking the beach, that will instantly make you feel free to kick back, relax and just take in the views. The rooms are simple and clean…covering in full all the basic necessities for a true yogi. * Gavdos has a long tradition and therefore is a very popular destination for free campers. Guest who prefer to be even closer to nature have the option to camp on this wonderful beach under the shade of cedar trees and sleep under the stars. You can also take the boat from Athens to Chania. and arrive in Hora Sfakion around 08.30 just in time to catch the boat departing for Gavdos. There is a boat every Friday, Saturday and Sunday at 08.30-11.30 from Hora Sfakion. * A private boat can also be arranged for groups of over 10 people. Although it may sound a little hard to reach, we are positive that the experience will be compensating. 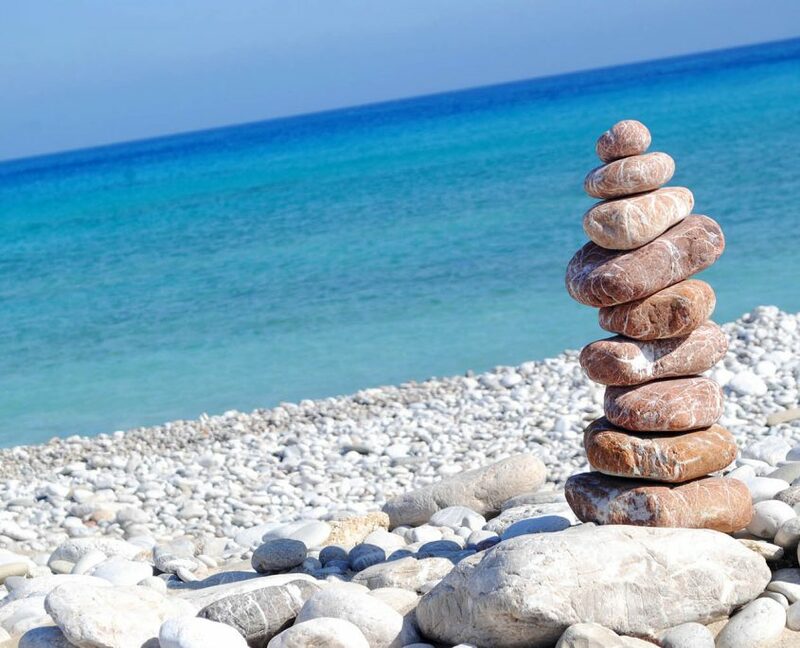 In order to register for our ‘yoga & simple living retreat‘ in the island of Gavdos please send us an email at info@lucreativestudio.gr with subject GAVDOS RETREAT. We will then send you a confirmation email with all necessary information as well as a short medical questionnaire to fill out. You will be requested to make a deposit of 50€ to secure your place. According to Homer’s Odyssey, Gavdos was the island where Odysseus was a cast away. Nymph Calypso in her attempt to lure Odysseus into living with her offered him immortality. Odysseus declined, longing only for his return to his wife Penelope. After 7 years of captivity, his prayers travelled to the mountain of the Gods, Olympus, and were heard by Zeus. Zeus sent the messenger God Hermes to order Calypso to free Odysseus and to help him on his journey. So Calypso helped Odysseus to build a boat of holy wood and also taught him to seek guidance from the stars and the moon. Marilou started practicing yoga from an early age with different yoga instructors in Greece and abroad. In 2006 she started working at Shantom, where she also participated in theoretical and practical workshops with Leda Shantala. In 2010 she received her first Yoga Teacher Training Diploma (RYT 200hr) from Sivananda Vedanta Centre and in 2013 she completed the Advanced Teacher Training Course (RYT 500hr) in Ghyta Yoga School with Michalis Filinis (both centers accredited by the Yoga Alliance International). She was naturally drawn to the Iyengar way, which she has been practicing over the last years with Zoi Gaitanidou at Yoga Summit. 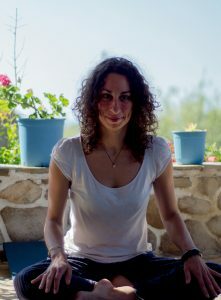 She also continues to enrich her knowledge participating in classes and workshops on different yoga styles with many inspiring teachers (Alessandro Ortona, Ephrat Michelson, Ana Forrest, Angela Farmer, Constantinos Giannetakis).taking classes and participating in workshops with many inspiring instructors. Her classes focus also on detail, precision and the structural alignment of the body, always with respect to individual boundaries and limitations.